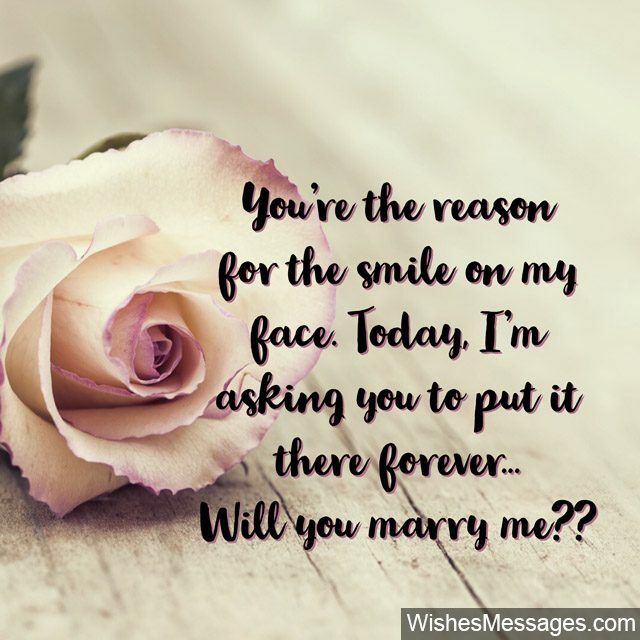 Will You Marry Me Quotes: How to propose to your girlfriend? Well for starters, stop Googling this question and start looking into your heart for the answer. The best words to use while going down on one knee are the words that actually have some meaning in your life. Look into her eyes as you give her the ring – which symbolises something larger than life. 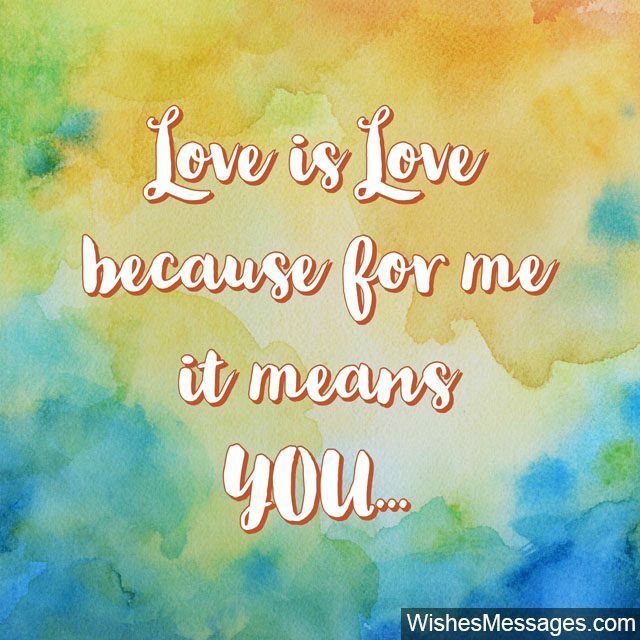 This post is buzzing with messages, one-liners, cute quotes and romantic things that are fit for such a special moment. But do NOT copy them. Read through for some inspo and make sure yours is the most touching marriage proposal ever heard. And congratulations to you both in advance! 1) We’ll hang out like best friends, make love like soul mates, fight like enemies, stay together like family. Will you marry me? 2) I knew you were my forever, when your happiness became more important than mine. Marry me, will you? 3) I’m asking you to marry me, not only because I know that we’re made for each other, but more importantly because I know that I cannot live a single day of my life without you being by my side. Will you marry me? 4) The sparkles in this engagement ring symbolize not just the beautiful moments that we’ve had but the ones that lie ahead. Will you marry me? 5) I can’t promise that life will be heavenly all the time. There will be times when life will be hell… but I promise we’ll go through it together, always. Will you marry me? 6) The biggest problem in my life is that I have only one lifetime to be with you… will you be mine forever? 7) Ever since the day we met, I knew I was meant to be yours till the end of time. Will you be mine forever? 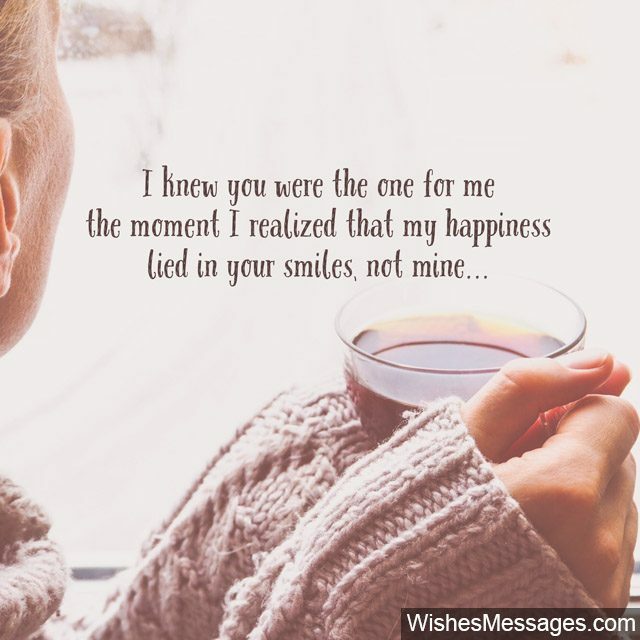 8) I knew you were the one for me the moment I realized that my happiness lied in your smiles, not mine. Will you marry me. 9) I don’t want to make any grand promises. All I want to say that the best is yet to come. Will you marry me! 10) In life, a lot of people will hold your hand. But no one will hold your heart the way I do. Will you marry me? 11) I can’t promise that nothing will ever go wrong in our lives. But I can promise that we’ll be side by side, taking all of life’s challenges head on and making the best of every moment that we’re alive. Will you marry me? 12) This ring is more than just a piece of jewellery. It’s a piece of my heart, a piece of my soul… given to you because they belong to no one else but you. Will you marry me? 13) Even a thousand lives aren’t worth a single lifetime spent with you. Be mine forever baby? 14) I’ve never known happiness like the way you’ve brought in my life… and I want to spend the rest of my life making you feel the same way. Will you marry me? 15) I’m in this for the long ride. I’m here to make you laugh and smile. I’m here to stand by you at every corner. I’m here to go on the journey of life with you, till the very end. 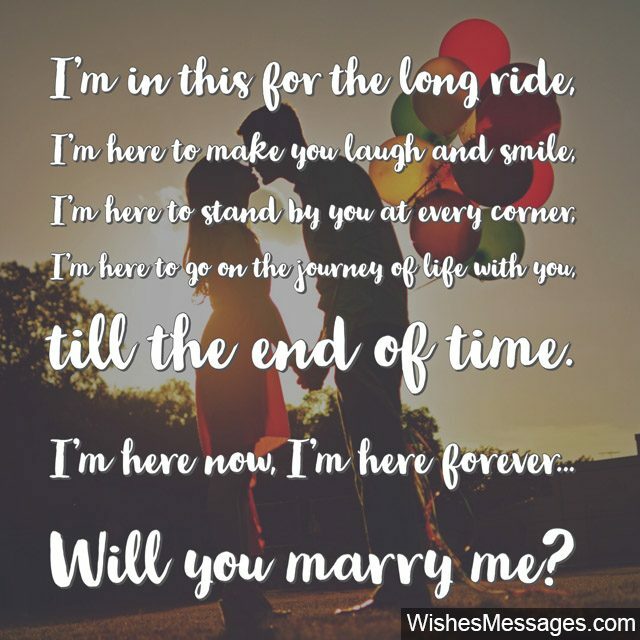 I’m here now, I’m here forever… will you marry me? 16) With all it’s ups and downs, I’d life my life with no one but you… now and till the end of time. Will you marry me? 17) Did you know that there are nearly 8 billion people on this earth? And out of all of them, I chose you… because you’re perfect! Will you marry me? 18) True love happens only once, they say, but they’re wrong. I fall in love every single day when I look into your eyes. Will you marry me? 19) Forget the pain, forget the hurt from the past…. forget everything and everyone who’s made you feel sad. I can’t promise to wipe away the bitter memories but I do promise to never ever be the reason for a frown on your face… ever! Will you marry me? 20) I can’t promise everything will be perfect. But I promise we’ll make it work, no matter how hard it gets. Be mine forever, will you? 21) I’m not asking you just to marry me. I’m asking you to hold my hand as we start a new chapter of our lives… the one that’s titled Forever… will you? 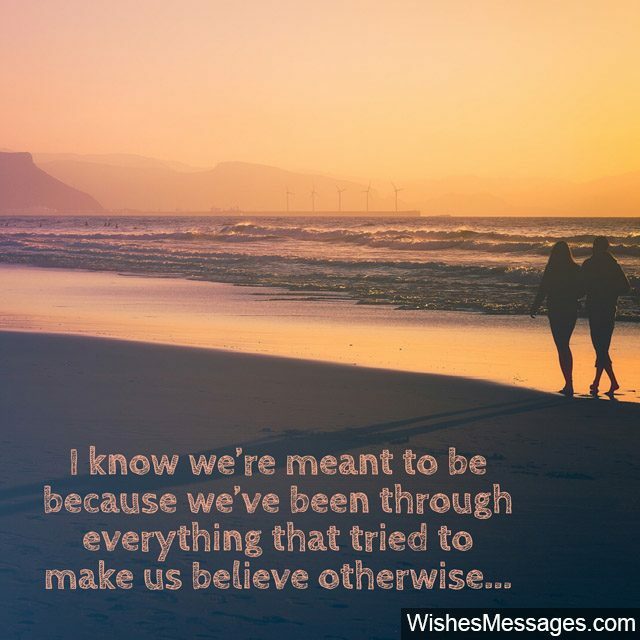 22) I know we’re meant to be, because we’ve been through everything that tried to make us believe otherwise. I love you, will you marry me? 23) I knew we were made for each other when I realized that even doing NOTHING with you meant EVERYTHING to me. Will you marry me? 24) My needs in life are quite simple – YOU. Be mine forever, won’t you? 25) Caring, emotional, crazy, loyal, faithful, dependable, supportive, understanding, flexible, annoying, cool and at times highly irritating… these are all the things I promise to be! Will you marry me? 26) Everything I need in life is Everything you are. I love you more than you can ever imagine… Marry me? 27) From attraction to trust to destiny, our love have come a long way. You could give many names to the feelings we’ve felt along the way but I want to sum it up with just a few words and say… we’re truly meant to be. Will you marry me? 28) Ever since the day we met, I’ve felt a sense of happiness in my life like never before. Will you marry me and make me the happiest man ever? 29) You’re the reason for the smile on my face. Today, I’m asking you to put it there forever. Will you marry me. 30) I want to be there for you when you’re down. I want to share life’s happiest moments with you. I want to pamper you whenever I can. I want to help you achieve your dreams. I want you to support me. I want to hold you close now and forever. Will you marry me? 31) In life, a lot of people will say and do things that’ll put smiles on your face. But I promise, only I’ll do the things that put a smile on your soul. Be mine forever, will you? 32) From positivity in the morning to a smiles in the evening – You’re the reason for my smiles, the reason for my happiness. The force behind my goals, the pillar to my life… its all you and only you baby. Will you marry me? 33) Tears fall down my cheeks when I think about all that we’ve been through. Ups and downs will come and go, but our love will forever grow. Will you marry me? 34) My life is worthless, without the person who gives it meaning. Will you marry me? 35) Everything I’ve done has led me to you… and everything I haven’t done in life yet, I want to do it with you. Will you marry me? 36) Love is love because for me it means YOU. Will you marry me? 37) I want you at your best and I want you more at your worst… now and forever. Will you marry me? 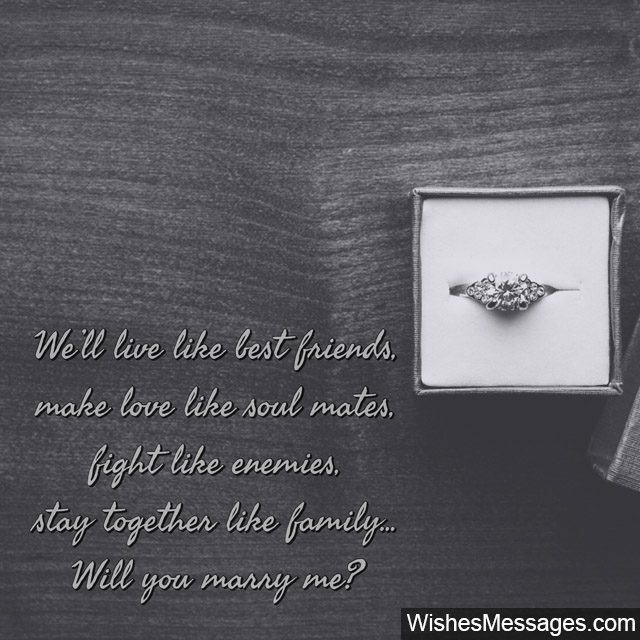 38) This ring symbolises not just our love but my commitment to be your soul mate. Not just now, not just for this lifetime, but for eternity. Will you marry me? 39) I’m caring. I’m loyal. I’m ambitious. I’m not a jerk. I’m trustworthy. I’m a good man… but all of this pales against one simple reason why I want you to be mine forever… and that is the fact that my life can never be complete without you. Will you marry me? 40) There are many ways to be happy in life. But I only know one person in the whole universe whom I’d want to share my happiness with…. That’s you! Will you marry me?